A Plutaluang man has been arrested for allegedly selling drugs to afford milk for his newborn. Sattahip and Royal Thai Navy officials captured Chatchai Udomzup, 29, after a sting operation went bust on at Soi Samnak Sonk March 12. While Chatchai initially avoided arrest, he was later captured and 44 methamphetamine tablets he allegedly discarded were recovered. Police also recovered 750 baht in marked bills. Sattahip Mayor Phawat Lertmukda said authorities were tipped off to Chatchai by another drug suspect. An undercover informant arranged to buy three tablets for 250 baht each. Once money was exchanged, however, Chatchai spotted the police and ran. The suspect said he needed cash to buy milk for a newborn baby. 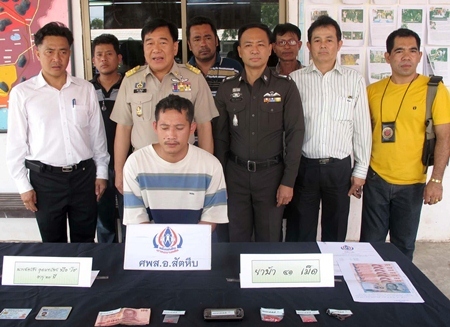 Sattahip and Royal Thai Navy officials captured Chatchai Udomzup (seated) for allegedly selling ya ba.